Two buses go past as I wait for the green man to appear. There are two people loitering near the stop. There’s no sign of the express service in the crawling metal convoy before me. I decide to take the train. I walk briskly towards the railway station. There is usually an ant like line of pedestrians along this route, not today. 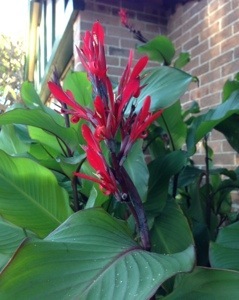 I notice the purple green leaves of a ginger in bloom. As I near my destination I see yellow and silver carriages setting off to the city. I smile to myself, at least I have captured a moment of morning stillness.